Does anyone even question the amazing filmmaking that comes out of Pixar Studios anymore? Well, “Cars 2” didn’t do them any favors, but still Pixar has evolved into one of the most impressive filmmaking teams in cinema. Me, I’m not the biggest animated movie guy. But even I can appreciate their amazing knack for good quality storytelling. That knack is once again on display with “Brave”. Once again Pixar gives us another solid animated feature mainly by following their proven formula. They take meatier subject matter and cover it with a beautiful and playful animated wrapping. They hire the perfect voice talent, create beautiful visuals, and throw in some fantastic music. This tried and true formula once again really pays off here even for a tepid animation guy like me. “Brave”starts off with the perfect approach. The first thing it does is give us a true sense of location via some of the greatest uses of scenery and surroundings I have seen. Even though I knew it was animated, I was amazed by the huge, sprawling, panoramic shots of the Scottish Highlands. The film creates a breathtaking natural canvas that quickly places us within the story’s location and environment. Tall trees, grassy meadows, jagged mountains, and beautiful streams grab us and submerge us into this beautiful land. This gorgeous landscape is the home of a young princess-to-be named Merida who lives with her brave but playful father King Fergus and her stern and often times overbearing mother Queen Elinor. Merida is an adventurous free spirit who loves archery and riding her horse through the countryside with her long, bright red locks of hair flowing in the wind. But her mother has quite a different vision for her. Queen Eleanor is infatuated with tradition and feels she knows what’s best for a young princess. A strong tension develops between the mother and daughter and it all boils over during a customary competition between three awkward princes from other clans vying for Merida’s hand in marriage. Merida wants no part of it so she hops on her horse and takes off. This infuriates the queen and sets in motion the events of the rest of the film. The tension soaked relationship between mother and daughter is at the heart of the story. Something takes place later in the film, and I don’t want to give away what it is, that causes both of them to reevaluate their relationship. This is one place where I give Pixar a lot of credit. This isn’t shallow stuff. This is pretty real and heavy subject matter and they tackle it with sensitivity and smarts. And once again they’re able to walk that line between being faithful to the weighty material and keeping it within the bounds of a fun animated family feature. But it’s not like this is a drab and overly serious film. This is a Pixar movie which means there’s a lot of fun and playfulness. King Fergus’ ‘typical male’ personality is a lot of fun. Even funnier are Merida’s rambunctious and mischievous little brothers – three little red-headed terrors who are always getting into something. I also loved the three Clan’s leaders and their sons. Talk about wacky! This peculiar bunch offered up some if the movie’s funniest moments. All of this worked for me but I have to admit that the heavy dose of slapstick silliness near the middle of the film began to wear me down. It seemed a bit monotonous and was pretty typical stuff. But this is a small part of the movie and things pick up on its way to its tender and rather satisfying ending. 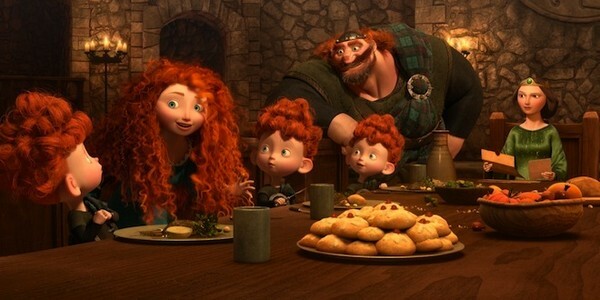 “Brave” is another winner from Pixar Studios. It’s a powerful and relevant story wrapped up in gorgeous animation and one of the best soundtracks of the year. The characters come to life through great voice work particularly from Kelly MacDonald, Billy Connolly, and Emma Thompson. All of these components come together to form an entertaining whole and even though it does contain some of the standard cartoony moments, its impossible to watch this movie and not have a great time. This isn’t the best Pixar film but it’s certainly a very good one. Want more great animation from 2012? Check out my review of the spectacular “Frankenweenie” . This entry was posted in Movie Reviews - B and tagged billy connolly, brave, brave movie review, emma thompson, kelly macdonald, movies, pixar. Bookmark the permalink. Great review Keith. Not Pixar Studios best, but still indeed very relevant. I liked it much–but it was dark and scary for a five year old. Which is your favorite Pixar? Mine is still “Up” and “Finding Nemo” …. I REALLY like “Up”. I swear it has one of the most touching and heartwarming openings I’ve ever seen! ha ha. I was not expecting to cry! That music pulled on my heart strings hard. I LOVED how they softened the scary Doberman by making him sound like he inhaled helium. Perfect. It was so good. I took my son to see it at the theater not expecting much. I really appreciated it. Hey Cindy, My 4 1/2 year old actually loved this when she saw it in Theatres. The obvious dark cave parts were scary, but she otherwise loves it. LOL Did she like A.I.? No. It’s before her time. Lol. She likes TANGLED and NARNIA. The beginning started off perfectly, but then it totally changes about mid-way through and automatically lost me. Totally didn’t deserve to win Best Animated Feature. Not at all. Nice review Keith. Thanks a lot! It didn’t really lose me totally but I did feel it hit sort of a standard cartoony lull. But I found the ending worked really well. “Does anyone even question the amazing filmmaking that comes out of Pixar Studios anymore?” You know? They’re not the iron clad locks that they used to be. Cars 2 (like you point out) was horrendous, and I dont know if Brave would have built Pixar’s reputation into what it is today if it had come first. 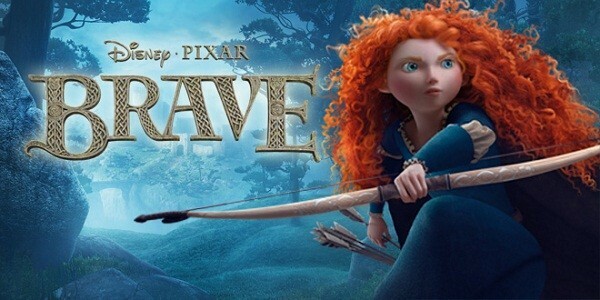 Brave IS a winner, dont get me wrong, I just dont think its on the same level as the movies that established Pixar’s dominance. BTW, their “Formula” goes deeper than that. Have you ever read the much ballyhooed Pixar guide to storytelling, or whatever they call it? They have a great great storytelling framework. I agree with you 100%. It’s not on the same level with Up or Wall-E (my two favorites). I thought this one was a weaker one for Pixar. Not bad mind you, just…i wasn’t as happy with it. I loved Frankenweenie more. The “twist” really frustrated me. I felt the first half had better attachment than the 2nd half. Still gave it a similar score as yours, but all in all, I need Pixar to come back stronger! Yes!!!! Frankenweenie was fantastic. Talk about one of the biggest surprises of the year! I rather liked this, but for other reasons it seems. Everything you mention Keith is accurate: story telling, character development, animation, music, the emotions and relations developed… all good. But for almost more than the 1st half of the movie, I was waiting for a male protagonist to show up, thinking: “Well of course, they have to have a male lead to this?” I was very pleasantly surprised when there wasn’t. My expectation kind of exposes a particular way of thinking in our society, especially when it comes to Disney movies, about there always having to be a male counterpart to ‘rescue’ or ‘help’ the lead Princess character. TANGLED would be a relevant example. But having a (now) 5 year old daughter, I freakin’ LOVED that BRAVE finally broke the cycle of and gave us a completely female centric story, with a lead character who would (in my opinion) be a helluva lot better role model for young girls than any other Disney princess thus far. Interesting. Honestly I never thought about that. Maybe I knew too much about it going in but I knew it was all about Merida. But I still got tripped up by its fall into more formulaic slapstick at one point as well as a lull around 3/4 of the way through. But for me it really picked itself up and delivered in the end. Great comments and some good food for thought! Very fine review sir. I love me some Brave. Not sure if that from a biased point of view but they really done their homework on this one. So many Scottish subtleties were included. Oh you do have some cool insights to this don’t you? You know I think one of the things that handicapped me here was my so-so like of animated films. I think that makes it tough for an animated film to make inroads with me (as Frankenweenie did). Not saying it’s right, just a flaw of mine I suppose. Great review!!! I wasn’t expecting to enjoy this film as much as I did. It makes me hopeful that we’ll start to see more female protagonist’s in animation. Even though its not their best outing, Pixar still sets the bar. Appreciate the comments. Pixar definitely sets the bar. Brave does a lot right and its a lot of fun to watch. Now it the “Oscar Winning” Brave! Appreciate the comments very much. To give you an example of the influence has I offer my little daughter. She loved it and she really felt it was a film that lifted up young ladies. And you could be onto something. The lulls in the film could have been direct rests of new handlers. If that’s the case what a shame!